A pressure washer is a fancy piece of equipment that is essentially a powerful hose. The machine works at an alarmingly high pressure that is used for washing off dirt, mold and dust from the sides of boats, cars, driveways and lawn equipment among other items. A pressure washer can also be used for removing loose paint from commercial spaces, such as warehouses and construction sites. However, if you intend on performing heavy-duty cleaning tasks, it is essential you invest in a gas powered commercial pressure washer. Unlike regular pressure washers, commercial equipment are designed while keeping daily use in mind. Commercial-grade machines typically feature better engines, better pumps and are designed to last longer. Manufacturers avoid using plastic and use quality components, such as brass connections, high-grade hoses and stainless lances. Cleaning power is another factor you should keep in mind when investing in a commercial-grade power washer. 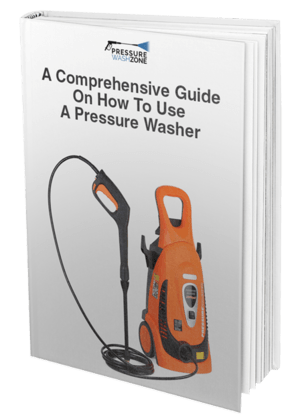 While there may be residential machines that offer high pressures, they are not meant for everyday use and are not built to survive wear and tear. 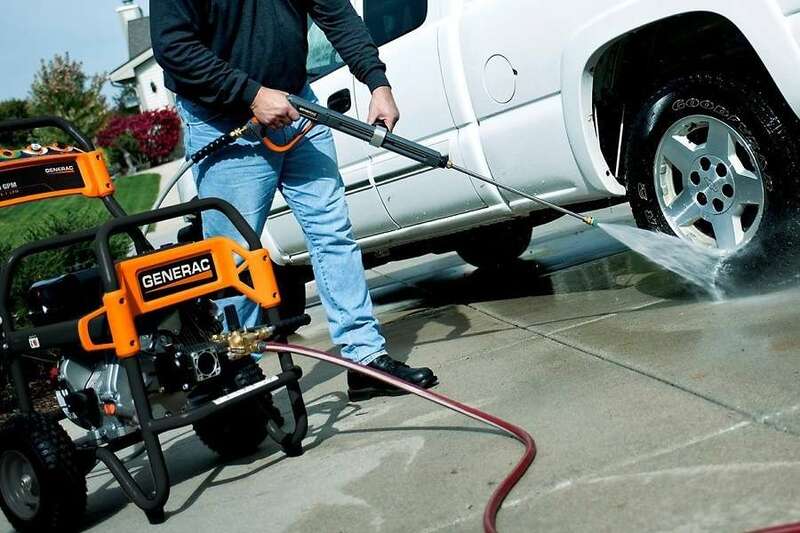 Generac is among the top-rated brands when it comes to manufacturing the best pressure washers in the market. The company has been around since 1959 and has established a reputable name in the industry. 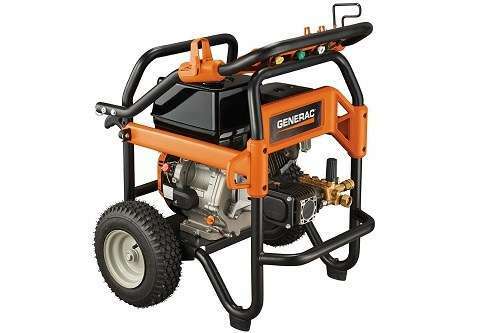 Generac 6565 is one of the best pressure washers in the market and is designed for commercial purposes. Exceptional Power - The machine shoots water at an impressing high pressure. The machine is powered by a 420CC engine that maxes out water at 4200 PSI. This means the flow rate is equal to an impressive 4 gallons per minute. This means you are unlikely to find a job that the machine can’t handle. 5 Nozzle Tips - The Generac 6565 allows you to tailor and customize the pressure output depending on your cleaning needs. The machine features 5 Quick Connect nozzles: 0°, 15°, 25°, 40° and soap that offers you the flexibility to perform a variety of cleaning tasks. 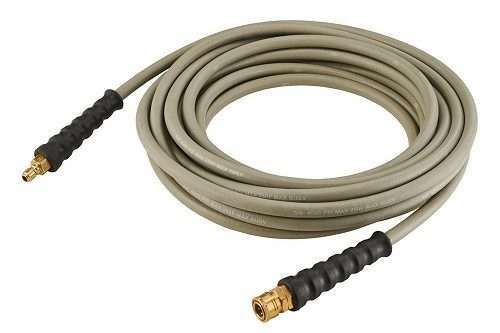 50-Foot Hose - The Generac 6565 features an impressive 50-foot hose. The long hose makes it possible for homeowners and professionals to clean tall walls and large surfaces without dragging the heavy machine from place to place. Keep the machine in one place and clean a variety of cleaning surfaces using the machine. 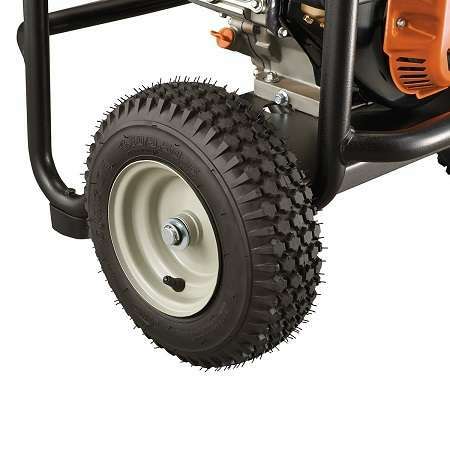 Oversized Pneumatic Tires - Rest assured, you won’t have any difficulty in moving around the hefty machine since it features oversized pneumatic tires. These tires not only maximize mobility but also feature shock absorption, making it easier for you to maneuver the machine. Pro-Grade Triplex Pump - The Generac 6565 features a pro-grade Triplex Pump that has a 4 times longer life compared to regular axial cam pumps. 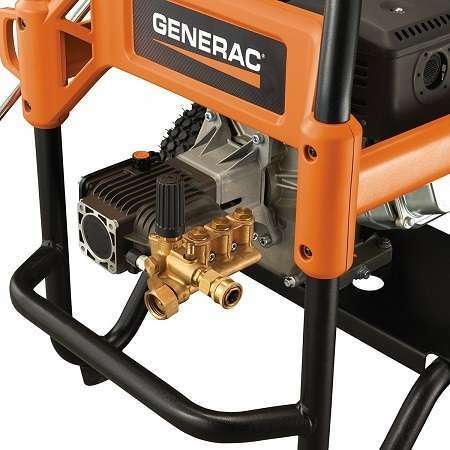 Since the pump is the core of the pressure washer, you can rest assured the Generac 6565 is worth every penny. Low-Oil Shutdown Sensor - The machine has a low oil-shutdown sensor that notifies the user when you are about to run out of fuel. This protects the engine and ensures the longevity of the machine. Amazing Durability - The Generac 6565 features a welded frame that offers exceptional durability. Consumers will be surprised to know the machine is easy to maneuver despite the welded surface. The Generac 6565 Gas Powered Commercial Pressure Washer received an average rating of 4.3 stars out of 5 on Amazon. This indicates a majority of customers are satisfied with the product and left positive reviews. However, there were a couple of consumers that weren’t too happy with the machine and agreed it could use a few improvements. Customers were pleased by how sturdy and powerful the machine felt. Most customers were happy with the overall design of the machine but a minor con is that the lever is positioned out of reach, which might cause some problems. Most customers were pleased that the machine could be used for cleaning a variety of surfaces. However, on the downside, a few customers had problems with starting the machine and said that it could take you a while to figure out how to use the machine. Another disadvantage is the machine is too noisy to operate so you should use proper ear protection. However, this isn’t a surprise when using commercial-grade machines. The Generac 6565 Gas Powered Commercial Pressure Washer can be purchased on Amazon at a reasonable price of just under $800. The price may vary depending on the seller and the condition of the machine. To save a few bucks, consider looking for promotional offers and discounts. Apart from Amazon, you can also purchase the product from eBay, Homedepot and Wal-Mart. Browse through these websites so you can purchase the product at the best price. Prices may also vary depending on the power of the machine. Consider investing in a different model if this one does not suit your needs. While this may seem expensive, the machine is quite reasonably priced compared to other high-end commercial pressure washers in the market. Overall, the Generac 6565 Gas Powered Commercial Pressure Washer is a great investment. However, the machine might not be suitable for newbies and people who don’t intend on using the pressure washer on a regular basis. 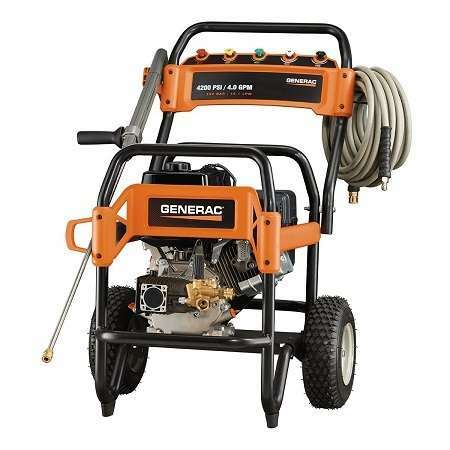 Consider checking out other Generac pressure washers if this one does not suit your needs. Good luck!